Each person’s unique gut microbiota is in constant communication with their immune system. This ensures good bacteria can thrive in the body, while bad bacteria and foreign material are eradicated. The gut microbiota is therefore critical to making sure the immune system is in the best possible state to fight diseases – from the flu, to serious ones like cancer. Researchers are now exploring how your unique gut bacteria determine your cancer risk, and whether modifying its composition can control cancer progression and predict response to treatment. 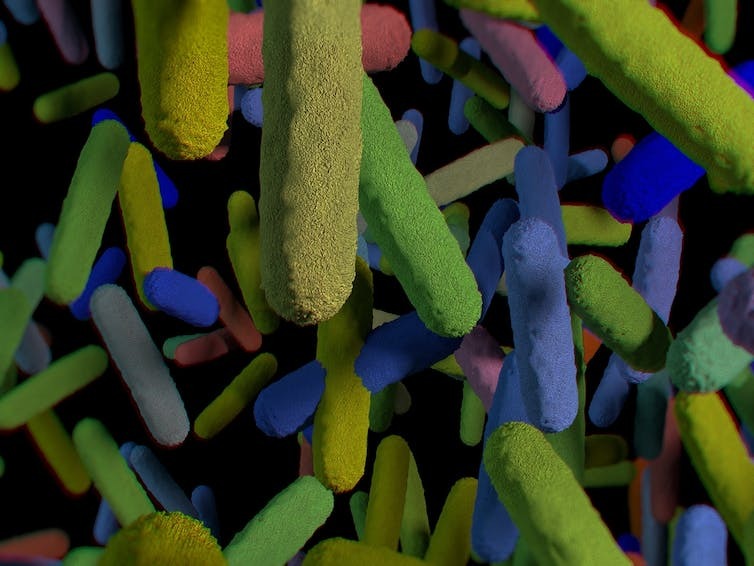 Everyone’s gut microbiota is unique, much like a fingerprint. In the first few years of life, it is at its most malleable, reflecting factors that occur during birth. For instance, babies born through caesarean section have been reported to have lower numbers of good bacteria and higher numbers of pathogenic (bad) bacteria, compared with babies born vaginally. Similar patterns have been reported in formula-fed infants, compared to those who have been breastfed. This suggests exposure to bacteria through diet shapes the composition of the gut microbiota in early life. We don’t exactly know what these differences mean as a child grows. But it is understood infants delivered through caesarean section not only have different gut bacteria, but are also more likely to develop allergies and immune-related diseases like asthma. The gut and immune system are closely linked. Just as our gut bacteria control our immune system, our immune system controls our gut bacteria. Research now suggests this interaction plays a significant role in determining cancer risk. Mice lacking certain immune molecules that slow the immune response, called anti-inflammatory cytokines, have more bad bacteria in their gut. This means a strong immune response ensures bad bacteria do not overpopulate our guts. These mice are also more susceptible to bowel cancer than those with sufficient numbers of anti-inflammatory cytokines. The heightened cancer risk can be transferred to normal mice through their faeces (poo). This involves collecting the poo from a donor mouse, in this case mice lacking anti-inflammatory cytokines, and feeding it to a recipient mouse. Poo from the donor mouse is rich in bacteria that reflects their gut microbiota. The high-risk mice have a lot of bad bacteria in their poo. Once transferred to the recipient mouse, these new bacteria flourish in the gut changing the composition of the microbiota. Research has shown when the new gut microbiota is established in the recipient mice, their risk of developing bowel cancer increases. A recent study conducted in humans paralleled these results. It showed long-term antibiotic use increased the risk of bowel cancer. Antibiotics are well known to disrupt the composition of the gut microbiota, just like the mice lacking anti-inflammatory cytokines, leading to more bad bacteria in the gut and an increased risk of bowel cancer. A review of research published in the journal Nature also points to the gut microbiota playing a role in how patients respond to chemotherapy. The review suggests the gut microbiota determines the effectiveness of chemotherapy in two ways: through activating chemotherapy drugs, and through its interaction with the immune system. These mechanisms have been best described in mice that lack a gut microbiota. Such mice, termed “germ-free” mice, are bred in completely sterile conditions. They are exposed to no external sources of bacteria and have no bacteria in any part of their body. Research has shown that chemotherapy in germ-free mice is less effective than in normal mice, and their tumours grow at higher rates. This may be because many chemotherapy drugs initiate an immune response that kills tumour cells through a process called inflammation. In this study, germ-free mice had lower levels of inflammatory markers in their tumours following chemotherapy, compared to normal mice. This indicates that the communication between the gut bacteria and immune system is critical for cancer treatment. Many chemotherapy drugs are delivered to the patient in an inactive form, which is then activated by special enzymes in the liver and directly by gut bacteria. Different levels of these liver enzymes determine how effective chemotherapy will be at killing tumour cells. Germ-free mice have more liver enzymes responsible for detoxifying chemotherapy drugs compared to normal mice. They are therefore able to eliminate the chemotherapy from their system very quickly. This leaves less time for the chemotherapy to kill tumour cells and therefore regulates the efficacy of treatment. Once again, these effects were reversed by faecal transfer from mice with a normal gut microbiota. In contrast, mice that have high levels of bad bacteria in their gut have also been shown to over-activate some chemotherapy drugs. Although this is thought to increase the ability of chemotherapy drugs to kill tumour cells, it can also cause unnecessary side effects as many chemotherapy drugs are unable to differentiate between healthy and tumour cells. The most common side effect of chemotherapy is diarrhoea. Chemotherapy-induced diarrhoea is acutely life threatening as it starves people of vital nutrients, making them susceptible to serious infection and death. Like cancer development and treatment, diarrhoea is associated with changes in the gut microbiota. Our yet-to-be published research found high levels of Proteobacteria in the gut before chemotherapy resulted in worsened diarrhoea and exacerbated weight loss in mice. This research supports growing evidence in human trials showing that the levels of gut bacteria in the poo of patients before they start cancer treatment predicts their likelihood of developing diarrhoea. Similar findings have also been shown in patients treated with radiotherapy. This research provides an opportunity to modify gut bacteria to optimise cancer treatment outcomes. This could be in the form of poo transfer, probiotics or even something as simple as changing someone’s diet. And the ability to understand someone’s risk, and modify it before chemotherapy starts, can ensure the perfect balance between chemotherapy response and toxicity is achieved. Work is currently being performed in Adelaide to identify the specific bacteria that are critical in determining chemotherapy response. Once this has been achieved, methods of mitigating risk can be evaluated and translated to patients.